Perhaps it was appropriate that I spent a recent weekend in a bog. 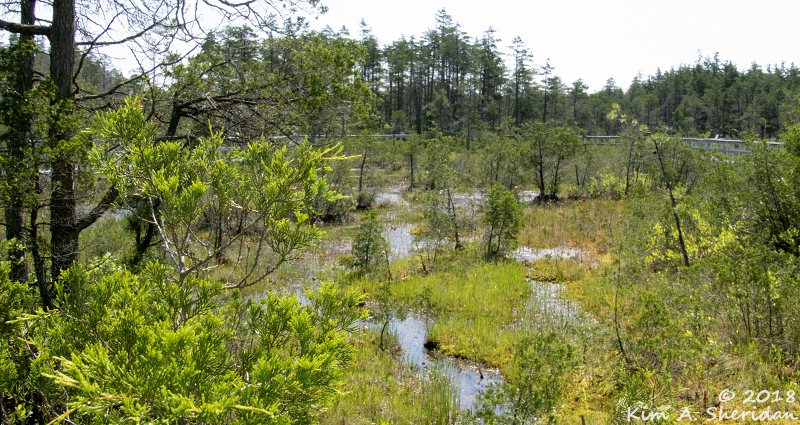 Webbs Mill Bog, that is, in the New Jersey Pine Barrens. This is a little gem for those who are botanically inclined. A water-logged oasis of heath, mosses, orchids and strange bug-eating plants awaits at the end of a secret path. Don assured us we’d find Curly-grass Fern, Schizaea pusilla, here. It’s a rare and tiny Pine Barrens specialty that was first discovered nearby in the early 1800s. A bog is a freshwater wetland, usually formed in a depression that is saturated with rainwater, rather than groundwater or a flowing stream. Without moving water, the environment is highly acidic and nutrient poor. Sphagnum moss. Most bogs form on dead, dying, decomposing sphagnum moss. 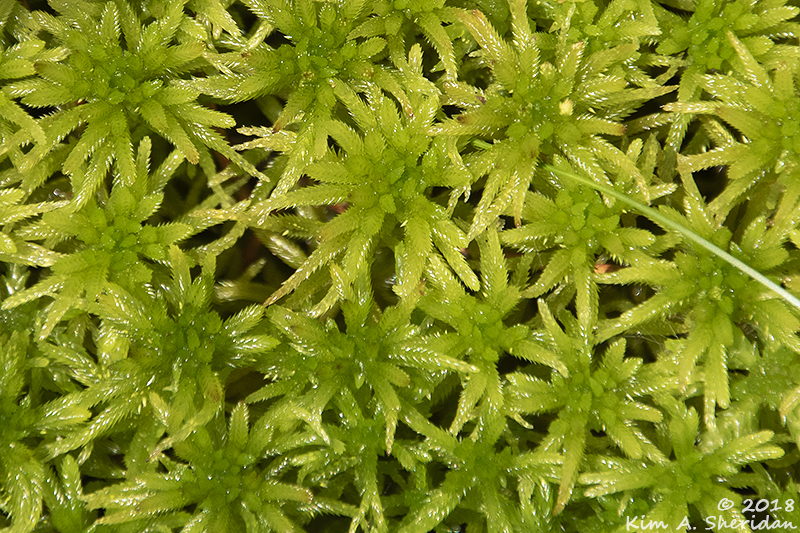 Sphagnum is highly absorbent, capable of holding water up to 25 times its weight. There are different types of bogs, with strange names like blanket bog and quaking bog. 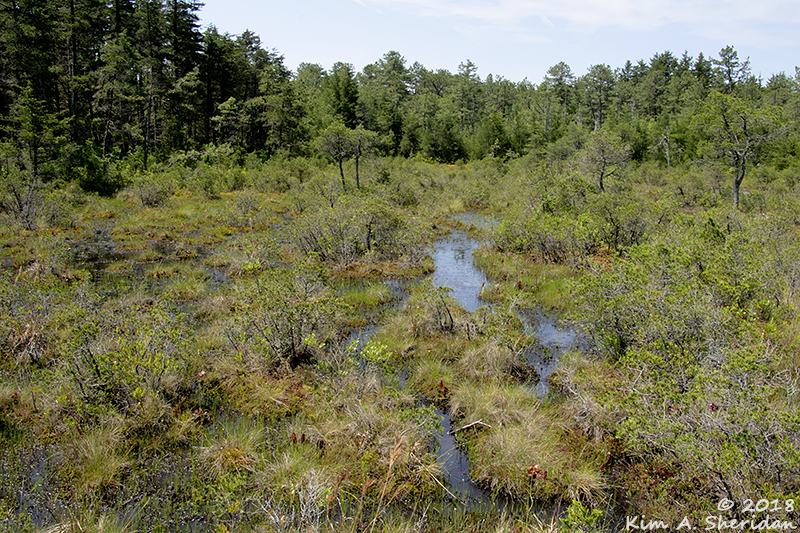 At different stages of their life-cycle, they may be bog meadows, shrub wetlands, or bog forests. There’s even something known as a fen, less acidic and with free-flowing water, which is somewhat like a bog-in-training. I got bogged down just trying to learn the difference between a bog and a fen. 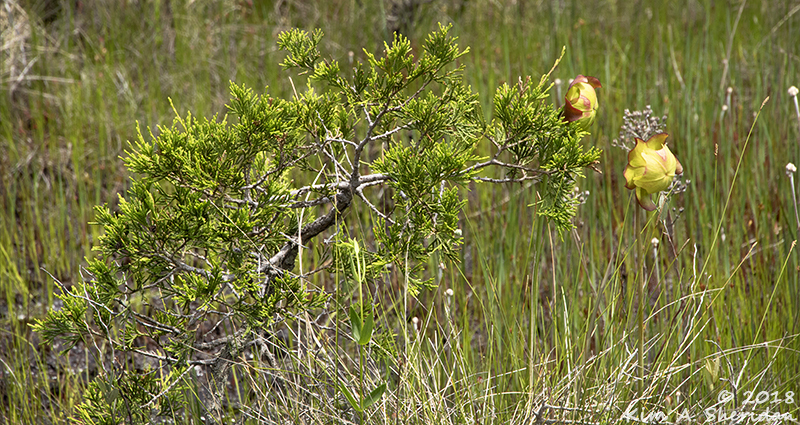 Only plants that can adapt to wet, acidic conditions thrive in a bog. 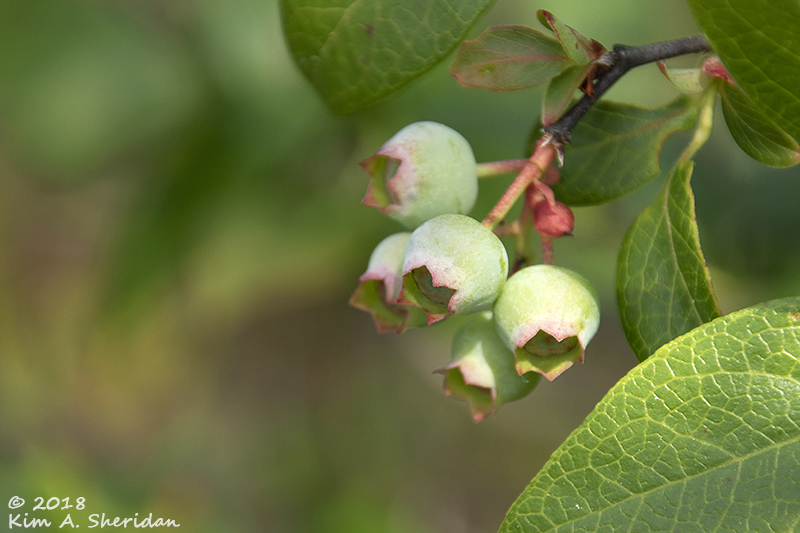 Shrubs in the heath family, for instance, like these high-bush blueberries, or leatherleaf or huckleberry. Atlantic White Cedar and Pitcher Plants. 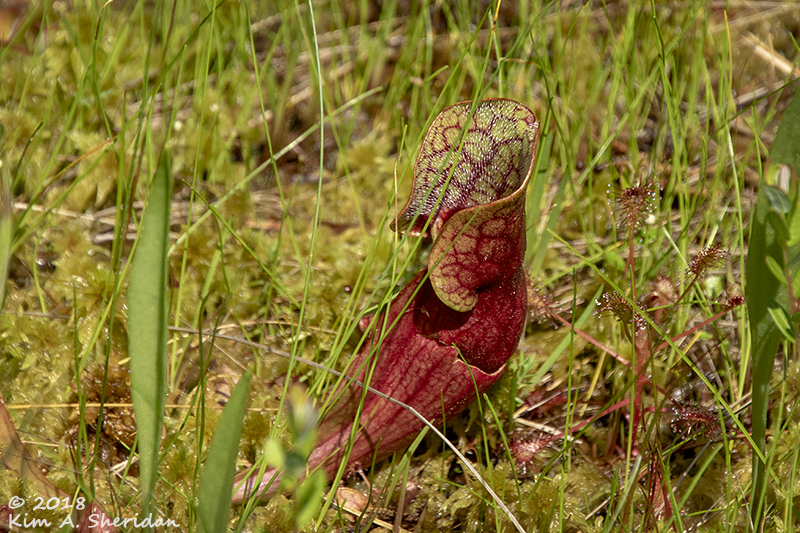 About those bug-eating plants… It seems carnivorous, or more properly, insectivorous plants are popular in bogs. In a low-nutrient environment, the ability to gain sustenance from animal matter is a helpful adaptation. Pitcher Plant flower. UPDATE: Don informs me that “Carnivorous plants were originally called insectivorous but then changed to carnivorous when they found frogs and other critters that were not bugs in the pitchers.” It is true that these plants will capture and digest spiders (which are not insects) and other Arthropods, at the least. 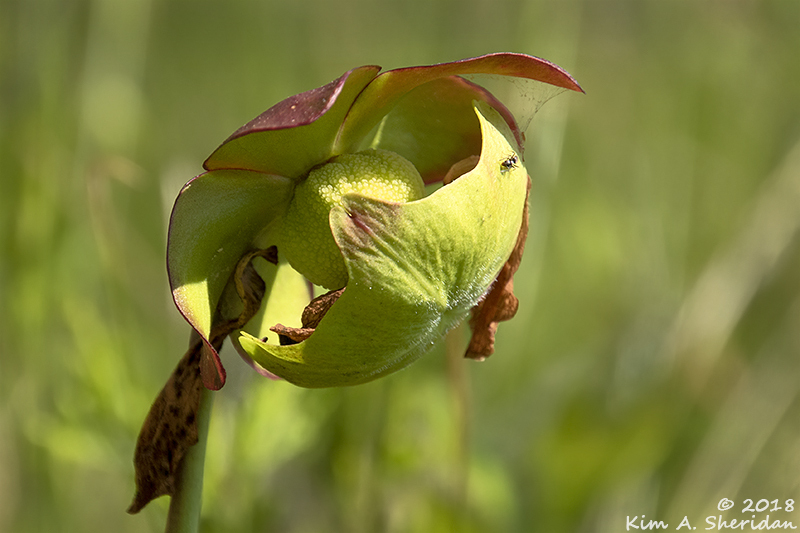 It’s not the flowers of the Pitcher Plant that eat the bugs though, it’s the pitchers. They lie in wait for a yummy meal to land in the bowl of the leaf. Downward pointing hairs prevent the escape of insects that are tempted in. The unfortunate bugs then drown and are digested. Sundews are so tiny, so delicate. Surely they wouldn’t harm a fly? They would though! 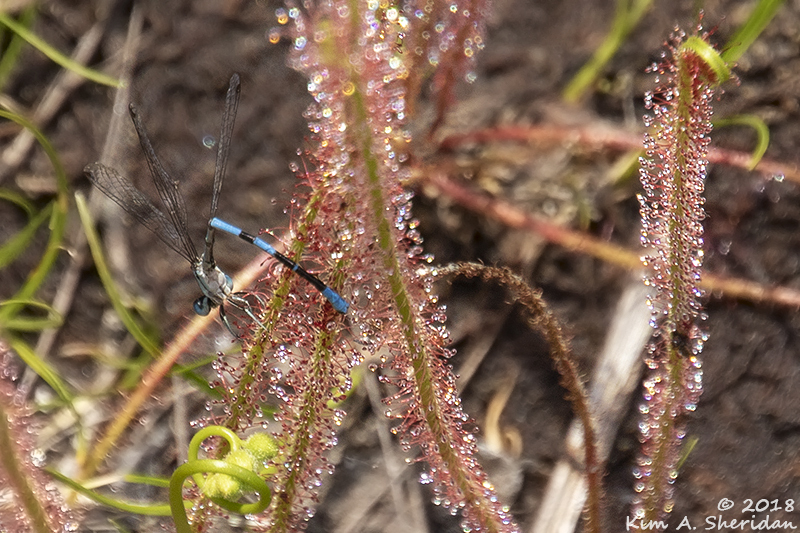 The sweet, sticky drops on this spatulate-leaved sundew can capture the most cautious bug. 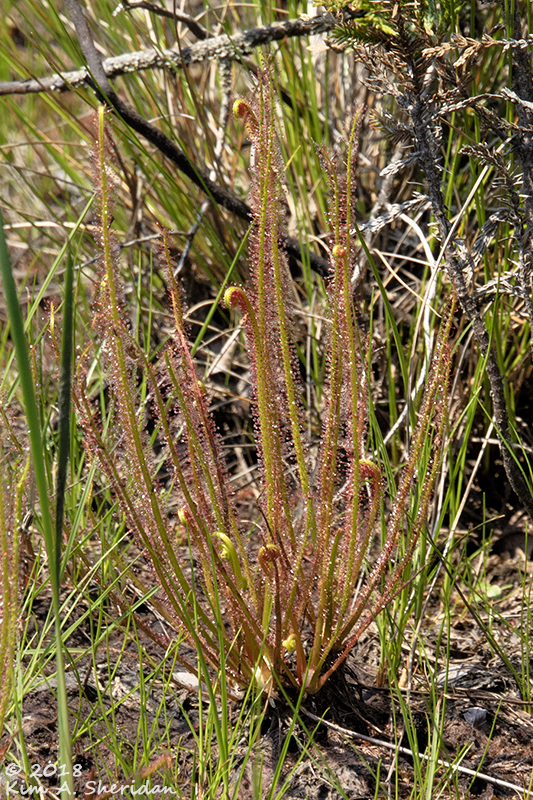 Thread-leaved sundews. These plants are only a few inches tall. They unfurl like the fiddleheads of ferns. 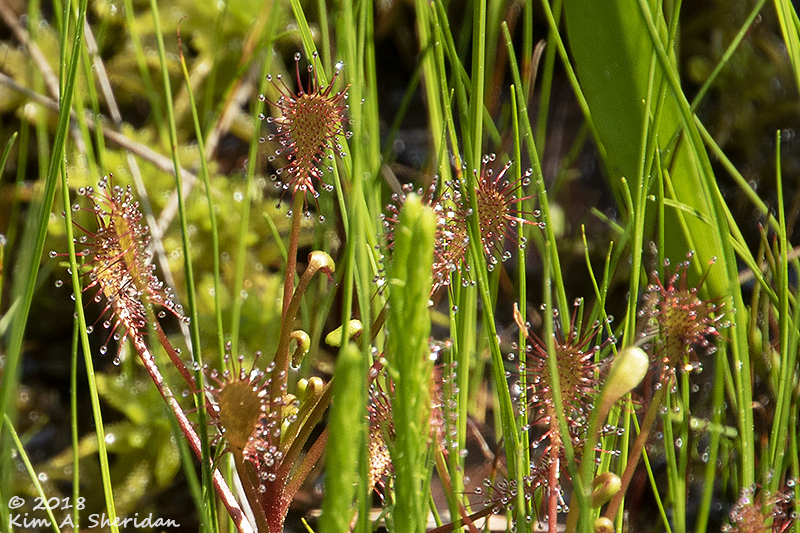 Thread-leaved sundews – and victim. I wondered why this damselfly was bent at such an odd angle. Then it dawned on me that she was stuck fast. Not all the critters were lunch. 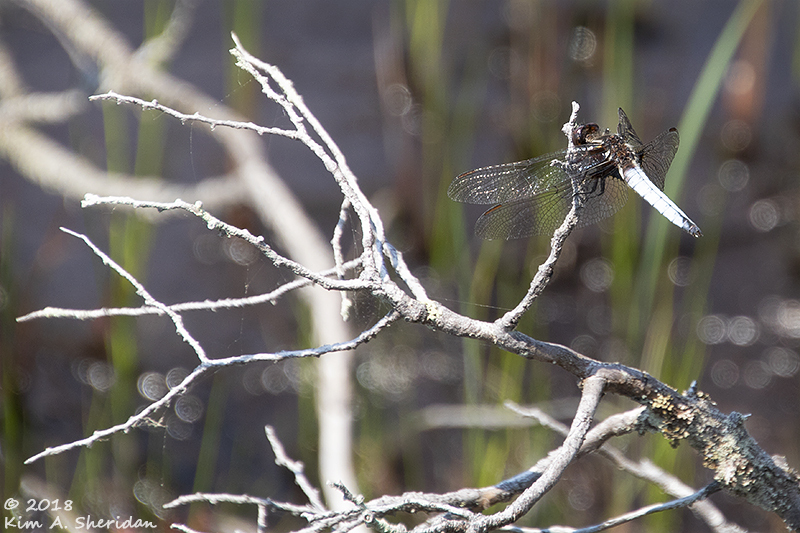 This dragonfly had avoided Webbs Mill’s many hazards. We only saw insects during our time here. But we know beavers have been active in the past, leading to flooding that periodically threatens the stable, change-resistance environment of the bog. The endangered Pine Barrens Treefrog has been found in Webbs Mill Bog. Don claims he’s heard one, but not seen it. UPDATE: (Don again) “Don heard a chorus, not one, of Pine Barrens Treefrogs at Webbs Mill Bog.” Don takes pride in his expertise in all things Piney, as well he should; he know the Pines like the back of his hand. The Wild Edge regrets the error. By the way, we never found those Curly-grass Ferns. A return visit late in the summer is in order. Hope the insectivorous plants take care of the skeeters! Which one of these flowers doesn’t belong with the others? 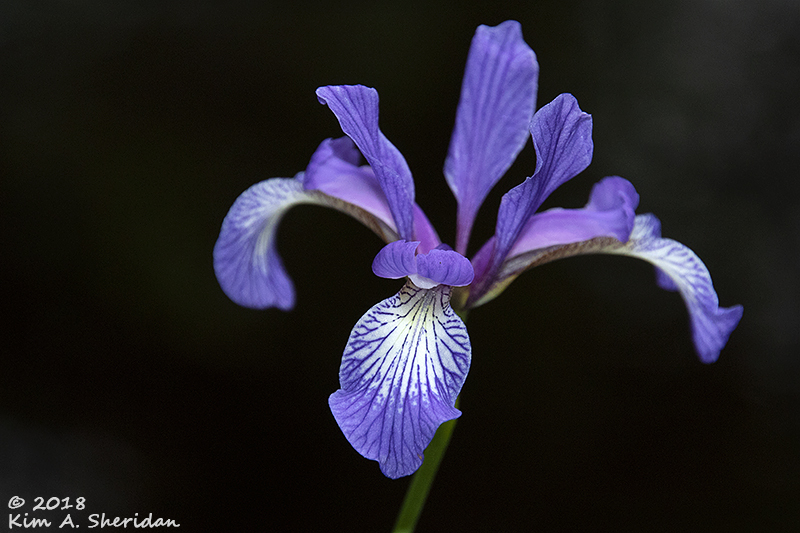 A Blue Iris, which Robb found later in the day along the Batsto River. Not a bog plant, but just too pretty to leave behind. The images I am accumulating may inspire, but time is fleeting. Every week I find myself falling further and further behind, sinking deeper in the mucky morass of to-do lists, chores and responsibilities. Maybe, just maybe, I can find a way to wrench my feet free of the mire. But for one day, in my beloved Pine Barrens, I didn’t mind being bogged down. Oh, no – not at all. 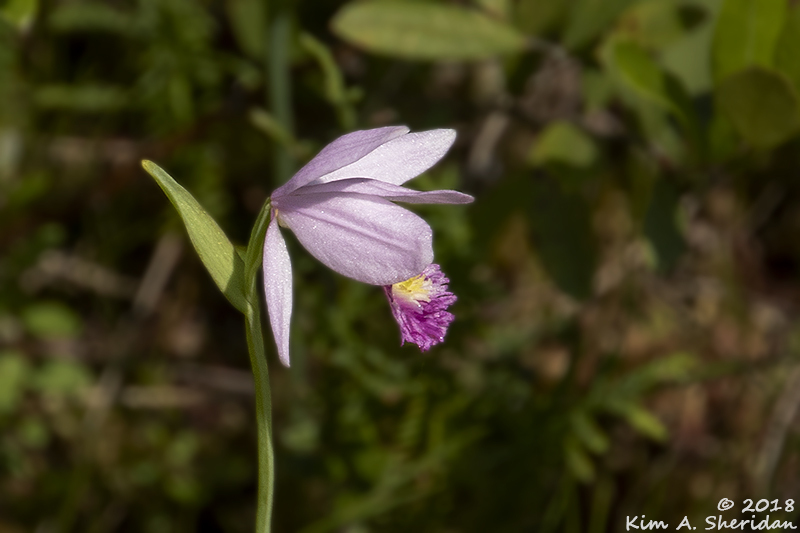 This entry was posted in Nature, Pine Barrens and tagged Bog, Nature, Pine Barrens, Webbs Mill Bog by Kim. Bookmark the permalink. 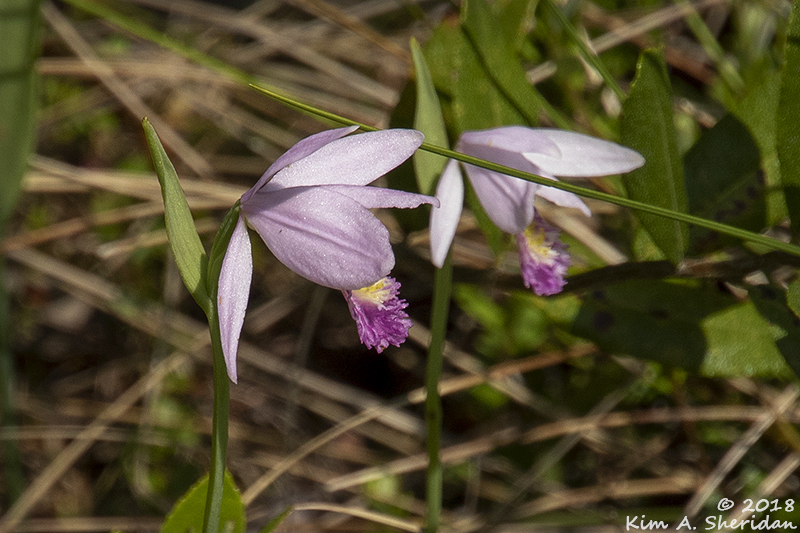 Kim, I can relate to feeling bogged down lately… Your photography talents and storytelling skills are truly inspiring! Thanks for sharing such a beautiful bog-blog!